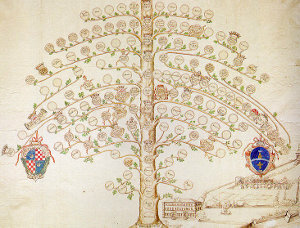 If you search your ancestors in Sora, Lazio, info about your Italian family are stored in the City Office archives or at the parishes. In towns and villages of Lazio and in Frosinone province registry offices were established in early 1800: it means that you could find information in Sora registrar as of that date. So, if your ancestors were in Sora in the nineteenth or twentieth century, then you could try to contact the City Office of Sora to know more. Before to start your genealogy research in Sora, we suggest you to read our tips for your search . They are useful to search in Lazio and in Sora too. 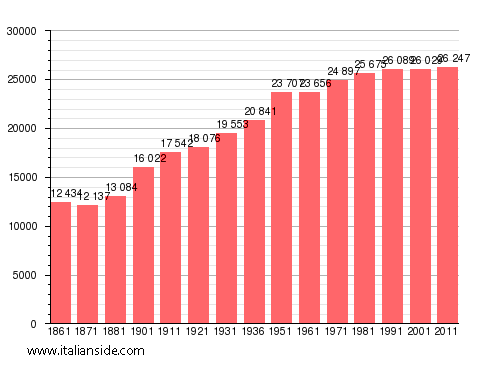 Next picture shows the demographic trends in Sora from the Italian Unification (1861) an important info to understand how many people lived there in the past. It could be important to know if the last name you are investigating is a frequent surname in Sora. As more your surname is common in Sora, as more it could be difficult to find the right info about your ancestors in Sora archives if you have not exact dates. If you have the opportunity to visit Sora and Frosinone province, you could plan to investigate churches’ archives by yourself, but from abroad is very difficult to obtain any result unless you find a reliable local help. If your research is in a dead end and you need professional help from our local Italian genealogists write to sora@italianside.com our expert in Sora area will study your request and will reply to you with a research plan and a quote. I’m in search of information on my maternal grandparents & great grandparents. My grandmother and her family (5 siblings and parents). My maternal grandmother Domenica Iarusci was 1 of 6 siblings born in Sora Lazio Italy August 1912. She married to Vincenzo Mammone January 9, 1909 in early 1930’s had 6 children they lived in Sora than in late 1930’s moved to Avezzano L’Aquila. She died young at 46 years on June 11, 1958. I am in search of information on her and her parents and grandparents. I do know one of her sister’s immigrated to OHIO in 1924 named Resituta Iarusci married Francesco Farina. Another sister Serafins Iarusci married name Farina like her sister and remained in Sora. Another sister married into a Capuccitti family had 6 or 8 children. They had 1 brother. I am aware the extended family are in Sora, Avezzano, England, Canton Ohio USA and Canada. Please help me discover who my maternal grandmother was and who her parents were? Decants family. Looking for sharing information on Francisco DeCiantis & relations. I am Dominico’s grandson and will be in Sora in a few weeks. One relative owns the Furniture Factory in Sora. My Mother was born in Sora. May 2nd 1919. Her name was Antoinette Marie DeCosemo. Her father name was Constantine DeCosemo, mother Rosa. They had returned to Sora during 1st World War. So my mother as born there. They left for England in 1920. I would really like to know if there are any DeCosem still living in Sora. I have very little information. I am looking for the DiGasperis family in Sora, Italy. My Great-Grandparents immigrated to the USA in 1900 and 1906. They were Vincenzo DiGasperis and Teresa Saracina (spelling is likely incorrect). His parents were Joseph (Guiseppe?) DiGasperis and Rosa Sincone. They had at least 4 other sons, Louis, Ernesto, Julius, and also a Charles? As of the 1950-1960s, several of my family visited Soar and descendants were still there. Please share any info as I am at a dead end. Audrey I am Your Aunt Mary’s daughter Linda. I was in Sora a number of years ago with my sisters Mary Beth and Madeline. We tried searching record at the town hall with out much luck. I am planning on going again next spring and would love to know who your family found there. How can we connect? I am trying to find any information about my grandfather Giovanni Paolucci born in 1903 in Sora. He moved to England. Are there any relations still in the area? I am researching my husband’s family that immigrated from Sora. His grandfather was Loreto DiNofrio b.1895 in Sora, Curusta and immigrated to the U.S.in 1913. According to his death certificate Loreto’s father was Louis and his mother was Alange Alonzo. He married Clara Recchia b.1897. Her father was Enrico Recchia and her mother was Carolina DeGasperis. The original spelling of their name could possibly be D’onofrio. Thanks for any help that you may be able to offer. My family emigrated to USA in mid 1960’s from Sora. My Grandfather’s name was Loretto and Grandmother Loretta, Cerrone. I do not know much else about my family, as my Dad is still alive but does not see any importance in sharing details. I would like to know who was my Grandparents parents or anything you can tell me about either side, the Cerrone family or my Grandmother’s maiden name. Thank you!!! My Grandfather Umberto Lucarelli was born in Sora 1904, he emigrated to U.S. in 1918, and settled in Chicago, he was an artist and old world wood worker by trade, his specialty was entirely hand made harpsichords. He passed this earth in 1990, I Love and Miss him much. hi I’m doing a family tree and trying to locate my family that I believe is from sora . my great grandparents were Dominic Panniccia (1903) & Vinceta Liberatorio they had 3 daughters Antonia, Doreen & Terresa they also had 3 sons Francis, Dominic & peter. my grandmother Antonia married a Johnson when living in North East England (UK). any information on other family would be great, as that’s all we know other relatives have travelled to italy to find any other family but unfortunatly havent been sucessful. Hi I have just read your message regarding our family. Peter is the only one left and still lives in Bishop Auckland. I am trying to find the birth place of my mother and any information about her family. She used to say she was from Arpino. My wife and I have visited Arpino twice and to date have found nothing. During our last visit a shopkeeper told us that her family name is normally from Sora, hence this message. My mother was Vincenza Villa, born 16th of May 1933 and moved to England in the early 1950’s but never returned to Italy (its a long and sad story why she didn’t come back). So I know very little about my Italian family but I do know my mother had at least two sisters, Anna and Lillianna and possibly a brother Umberto. I think my Grandfather may have been called Emilio because that is my middle name. Any information would be gratefully received by me and my family. We are planning to visit Sora soon. Looking for information regarding Vincenzo Tersigni, born in 1895, emigrated to US around 1920. Looking for my paternal great – grandparents names who lived in Sora. My Grandfather’s name was Luigi Tersigni and he was married to Serafina (nee Maria Domenica Iarusci). Luigi Tersigni was born either in 1879 or 1880. Serafina was born 1905. Yes He was considerably older! Interesting fact is that apparently, Serafina had the same two first names as her sister – Maria Domenica. Luigi travelled to New York quite a bit. My great grandparents, Silvestro Pompilio (born 1840) and Maria Caschera Pompilio (born 1845) had many children, including my grandfather Nicola Pompilio (born 1881) and his brothers, Giovanni, Vincezo and Antonio, all of whom immigrated to the USA between 1902 and 1910. They were from Sora. I’m looking for any information anyone may have that relates to my family. Thank you. We are trying to find out information about my husband’s Aunt and Uncle – Rosina Rizza (aged 10 years) and Joseph Rizza (aged 5 years). Both children died in the Civic Hospital Sora – Joseph died on the 15th October 1947 and Rosina died on the 17th October 1947 (2 days apart). We have the consular returns of deaths – both deaths were registered on the same day 23rd October 1947. We are interested to know what was the actual cause of death for the children and if we can access any hospital records? We would like to know when they were admitted to hospital etc? The children had travelled to Italy on holiday (staying with their grandparents Tomaso and Maria Rizza in Belmonte Castello), but took ill and died. They were buried in Sora – we visited Sora a couple of years ago, but were unable to locate their grave. We understand from a groundsman at the cemetery that the children had originally been placed in a grave in the wall, but he explained (we have poor Italian) that as no-one had visited they removed the children’s remains and placed these in a pit in the ground so we could see no trace of the graves. We are visiting Sora again and we would love to be able to get more information on the children – are there still marked graves somewhere? Can we access hospital records? Will there be death certificates for the children in the Italian records? My great grandfather was Luigi Valente who married Teresa Frezza .they came to Birmingham in the late 1800’s. They had 4 children who lived Elmarinda, Mary, Adelaide (my grandmother ,born in Birmingham in march 1893) and Frank. Hello! I am looking for relatives in Sora. My great Grandparents were Virginia and Attillio Iucci; they had two daughters – Inez and Dina Iucci. Inez Iucci is my Grandmother, she was born in Sora on June 15, 1916. Virginia Iucci’s nephew is Vincenzo Iannuccelli and his last known address is in Sora. I’d appreciate any help you can give; I am planning a trip to Sora in May and would love to see where my Grandmother grew up. Thank you! I am looking for information on my family who were from Sora, the surename was Valentini. My grandfather was Sabatino and he was married to a Maria Deciantis; There had children: Emilio, James (Vincenzo), Rudolph, Pasquale born in 1920’s ; they also had a daughter Lydia or (Lidia) who died at 27 in Sora while on vacation. I have no information prior to this period, what I have found is conflicts with Sabatino, ship records he is Pasquale, so perhaps his name was Pasquale Sabatino or vice versa any help is appreciated. I will pay someone to look into these details. I see you are looking for someone with the surname of Notarantonio from Sora. I have relatives in Sora with that last name I am sure I can help you. I am very interested in learning about my father’s family. His name was Francesco (Frank) Cristini. He was born in Sora in 1899 to Vincenzo and Loreta Lucarelli Cristini. I think he had a brother named Donato and a sister named Rosetta. I would really like to know more about my father’s ancestry and would also really like to be able to contact descendants in his family. My father married Maria Laura Benacquista from Broccostella. She had a brother named Enrico Benacquista and a sister named Colomba whose married surname was Farina. Enrico had 4 daughters; Elmerinda, Laurida, Elena, and Gina. I would very much appreciate any information about my father especially because he had no relatives that I know of in America. I am also interested in knowing if Enrico’s daughters had children I can contact. Thank you for making this site available. Hi, I’m looking for information on my great-grandfather’s family. His name was Vincenzo Pellegrino (b. December 26, 1893) but I can’t find anything about him before he came to the US in 1909. I know he had 2 brothers, Julius and Anthony (possibly Antonio, family wasn’t sure), but I can’t find info before US for them other than they were all born in Sora, Italy and moved to Ohio, US. Even just the names of his parents would be super helpful. Hi, My grandfather and grandmother are both Italian, the information I have is my Grandfather was born in Sora, his name was Dominic Palleschi, he married my grandmother liberate Ambrosia in the U.K. he was a prisoner of war held on the island of jersey. I have no other details, except he had other family, and they continue to live in Sora. Thank you for any information, you are able to give me. Hi Marilyn, I too am trying to trace any relatives I might have in Sora. My grandparents are also Dominic and Liberrata we have photos of them. My father was Louis and he had siblings called Carmine,Albert,Lenny,Mary and Vera who lived in the north East. I would imagine we are cousins. My grandparents were interned on the Isle of man. Would love to hear from you. I am searching for my 2nd great granparents family in Sora, Italy. His name Vincenzo Giamberardino (or Bradini). Born June 19, 1879. Her name is Giulia Sardellietti. Born 1879. They had a son Robert born 1899 in Isola Del Liri.I believe they immigrated to New York, USA. Then later to Brampton Ontario Canada. I have been trying for the past 15 years to find information about my Gx2 Grandma Amelia Rea born in Sora about 1889 (she married Luigi Antonio coletti in 1909 in Glasgow)Her mother I believe was Angelina Latessa and her father Giacinto Rea (born about 1853?) they both were also from Sora. My mother and I plan to visit Sora next year as we’ve run out of all leads researching from the UK. I am researching my husbands family. His grandmother on his mothers side was Caterina Rea and from Sora. I would love to know if her name has come up in your research. We r off to Sora this August to see what we can find. I am just starting the journey to find his family and am finding it very interesting. At present I haven’t found a Catrina Rea. I am searching for my grandmother’s family all born in Sora, Italy. Her maiden name is Teresa Pasquarelli and she married Vincenzo Terribile in Sora on ottobre13, 1906. Thanks for your time & any assistance or suggestions you can provide. Would love to know about my grandparents Bernardino Caringi born on feb 26, 1890 and my grandmother Loretta (maiden name DiMaola) from Sora, italy. Any informatjon you can give me would be appreciated. Hi this a nice surprise to find this site. I’m looking for my Great Grandfather and mother and to know more about them and thier families. I’m certain my Great Grandmother’s name was Teresa Recchia and believe she married “Angelo” Tatangelo. I’m descended from the Tatangelo line coming out of Sora. My Grandfather Loreto born 1892 and his brother John born about 1880 both came to America in the early part of the 19th century; there other brother Carmine stayed in Italy and fought during WWI. Any where you would point me I would be happy to go to find out more. My grandfather’s name was Loreto and my Dads name was Angelo Tatangelo! We could be relatives! I always heard the family was from the Naples area. We’re spending a month in Italy next year to search for roots! hi there! oh my goodness. ok i am looking for a roco tatangelo! any relations??? Hi Christina, i’m not sure from the limited information on the Sora Tatangelos I have. Let me know if you find some. Good look with your search. My grandfather was Guiseppe Recchia married to Concetta Christini both born in Sora one child my dad Mario. My grandmother’s maiden name was Tatangelo. Her name was Andreana. Hi Pio, my research has not shown that connection…….but who knows. Hi Jim, we are related cousin and think we spoke last year. Remember my Uncle Newell. Did not see this post until today. We are trying to find Italian relatives of Ferdinand Recchia who was born in Sora, Frosinone, Lazio early 1980s and who then emigrated to Birmingham, England some time before 1915. We also believe he had a twin brother. In 1915 he married an Italian lady in England who had also come over from Italy – we believe from the Napoli region. Her name was Amelia Marcantonio and she was born mid 1890s. Any assistance would be greatly appreciated. We have visited Sora and checked the book of births in the town’s library but for whatever reason he was not listed. I am looking for my ancestors in Lazio Sora Frosinone, Italy. My grandfather, Santy Recchio, born September 14, 1904 in Sora Lazio as well as my grandmother Mary Pellegrene born September 6,1909. I believe they were married in Italy and moved to ohio, USA. Mary’s parents were Valeria Cirelli and Vincenzo Pellegrene. I would love to know if there are any Pellegrene/ Recchio or Recchia family still there, or nearby. I am in the USA,(near NYC) and would like to know before taking a trip this summer. This may be a coincidence ,My ex-husband’s name is Sam (Santino) Cirelli he has a friend named Sante or Santy ? Recchio we live in Canton, Ohio , I believe he also has relatives by the name of Pellegrene . I am trying to locate his Sister who dies in Sora,Italy we are trying to find were she is buried this would have been in the 30’s or 40’s ? I have just started my search . My home phone no. is 330-455-4967 I do not know if there is any connection or not ? The Sante Recchio he knows or knew would be in his 80’s I wish you much luck in your search. I am looking for my ancestors in Lazio Soro Frosinone, Italy. My loving grandfather, Luigi Ariante, born June 1882 in Sora Lazio, moved to Essex County, NJ (USA) in June 1916. I would be grateful to know if there are any Ariante family still there, or nearby, or possibly in the Naples region. I am in the USA,(near NYC) and would like to know before taking my trip there. Baptist at. Can you help me? Sto scrivendo questo messaggio per la mia zia Mary Law. Sua bisnonna si chiamava Maria Trombetta ed e nata il 27 novembre 1867 a Isola del Liri. Lei ha sposata Giuseppe Mezzono (nato il 24.02.1864 a Sora) circa 1892. Mia zia vorebbe sapere se ci sono parenti ancora in Italia e vorebbe mettersi in contatto con loro. La famiglia di Mary sono emigrati in inghilterra in 1898 e hanno avuto almeno 3 bambini. Sarei molto grata di qualsiasi informazione che abbiate. I am looking for information regarding Luigi Valente (Master Grocer) who married Theresa Valente (Maiden name Frezza) in Sora in mid to late 1800s. They had three daughters in Sora Adeleine, Miranda and Mary. I would like to trace my family tree. Luigi and Teresa were my Great grandparents. Her maiden name is Pasqua FIORINI and she married Pasquale Facchini. Liberata b. 1879, & Vincenzo b. 1885 or 1889. I am trying to research my grandfather, Carmine Civico, who, I understand, was born is Sora in about 1881. Neat site! Hopefully you can point me in the right direction as far as services available and maybe pointers on writing to the proper town offices. I’m looking for the Cerqua (Vincenzo b.1874) family of Sora and the Moscone (Archangela b.1884) family of Atina same time frame. They both emigrated to the UK and then the US around 1900. I’ve heard of different pre-compiled family histories available but haven’t a clue how to get at them! Did these Cerquas come to the USA and live in Philadelphia? My sis-laws Mom was a Cerqua. Her Mother was Rosa (Rosina) and I think the husband was Antonio. Not sure of his relatives right now but could ask her. She goes to visit relatives in Italy who are members of that family still. If you would like to start a research in Sora please send your request to sora@italianside.com.